While surfing the net, I came across this article below. It is my opinion that in general, cancer is not a medical emergency that requires immediate invasive and toxic interventions. It is a degenerative condition that requires improving of health. There are medical emergencies that require the best medical help you can find. Car accidents with catastrophic injuries or life-threatening burns are examples. In those cases, you need the best emergency room you can find. Cancer can become a medical emergency. If the digestive tract is completely blocked by a tumor so that passage of material is impossible, emergency surgery may be needed. If breathing is becoming impossible due to a tumor blocking the respiratory tract, emergency intervention is appropriate. If a tumor in the brain has grown to the point where there is pressure that is causing damage, surgery may be advisable. It also possible that medical treatment for cancer will cause enough damage that more medical treatment will be required. But in general, cancer is not a condition that requires treatments that actually worsen health. Many people are trying to recover from cancer with non-toxic therapies. This is an attainable goal and it is often achieved. Patients often spend a lot more money than necessary and take huge numbers of pills, many of which do not have a direct bearing on their problem and may even block progress. More may not be better! People sometimes tell me that they were perfectly healthy until the cancer suddenly appeared. I point out that they were not really healthy. They had viral infections, toxic metals, parasites, infections in tooth sockets, radiation stress, bowel toxicity, chemical toxicity and probably mold toxicity. There may have been a metabolic imbalance. In other words, the things that cause cancer. The things that have to go away so they can get well. Anyone with a condition that normally requires the services of a physician is urged to consult one. Ask your physician if this program can be used alongside whatever medical treatment you decide on. This is not a “cure” for cancer. It is a method of becoming healthy. If you are considering chemotherapy or radiation, ask your oncologist if the suggested therapy ever cures your kind of cancer. If the answer is “no”, then THINK ABOUT THIS! Of those who depend on chemotherapy for survival (in other words, the surgeon “did not get it all”), the five year survival rate is only 2.1%. For some cancers the rate is better, but for some types of cancer, it is 0%. Does this make you feel like chemotherapy is a cruel fraud in most cases? If you do not get that impression yet, please study the chart (Table below) some more! The above table is taken from the paper published in Clinical Oncology (2004) 16: 549 -560, written by Graeme Morgan (*), Robyn Wardy (**), Michael Bartonz (***), (*) Department of Radiation Oncology, Northern Sydney Cancer Centre, Royal North Shore Hospital, Sydney, NSW; (**)Department of Medical Oncology, St Vincent’s Hospital, Sydney, NSW; (***) Collaboration for Cancer Outcomes Research and Evaluation, Liverpool Health Service, Sydney, NSW, Australia. Let me highlight what the table tells us. 1. A total of 154,971 Americans underwent chemotherapy for their cancers. After five-years, only 3306 were alive, the others died. That works out to 2.1% of Americans benefited from chemotherapy. 2. Different cancers respond differently to chemotherapy – there is no such thing as one size-fit-all for patients. The benefit you get from chemotherapy depends on what type of cancer you have. So beware of this! 3. Chemotherapy provides benefit in excess of 10% in only four types of cancer. Of these four, two are rare. The most common in this group is Non-Hodgkin lymphoma and the five-year benefit of chemotherapy is only 10.5%, for cervical cancer it is only 12%. 4. Chemotherapy provides only 8.9%, 4.9 %, 3.7% and 3.4% five-year benefit in four types of cancer. 5. Chemotherapy provides less than 2 % five-year benefit in the cancers that most Americans suffer from – breast, lung, Colon, etc. 6. 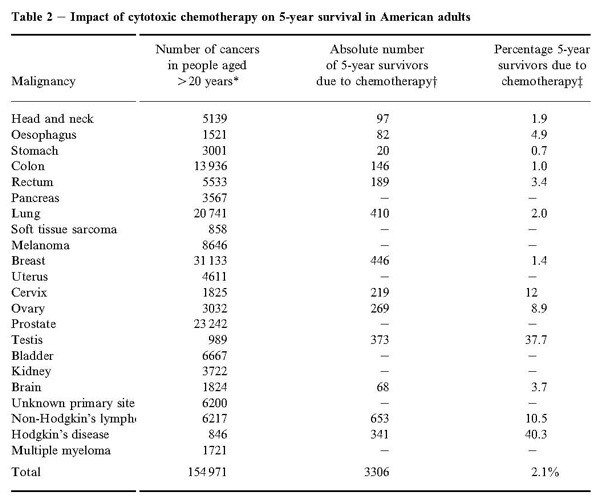 Chemotherapy provides zero five-year benefit to the cancers in the table below. This entry was posted in Failure Story, Medical treatments and tagged American patients, chemotherapy, contribution by CA Care. Bookmark the permalink.